Funny story. It’s week two for creative enterprise Kaospilot students at their outpost in Cape Town in spring 2012. A core team of students and Capetonians are in the early stages of figuring out how to run a 100 in 1 Day project. The natural first step, following an initial meeting on the concept, was to buy the domain — 100in1day.co.za. Student Nicolás Arroyo confirmed its availability on the morning after the meeting, but two hours later it was already taken. The team was pretty bummed out for the next while. They figured that someone purchased the domain, as some people do, hoping to sell it and make a buck. A week later, Nicolás realized that he had received a message on Twitter that he missed the week before. The message was from someone he didn’t know, who said he heard about the 100 in 1 Day project and he purchased the domain as his contribution. He had no connection with anyone on the team. “He didn’t ask for permission; he just did it,” Nicolás says. This is the kind of co-ownership, collaboration and shared responsibility that emerged with the 100 in 1 Day project in Cape Town last spring. 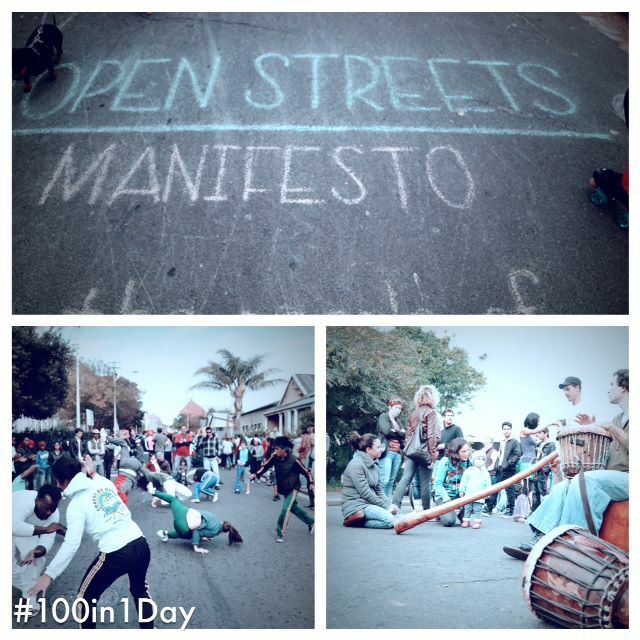 Thismarked the first English-language iteration of 100 in 1 Day, a citizen-led project to implement at least 100 urban interventions that improve the quality of life in a city on a single day. Nicolás called and met with the mystery domain name purchaser. He didn’t fit the typical profile of the kind of person one would expect to participate in a project like this one — someone between the ages of 25 to 30 with strong cultural or social interests. He was a 40-something IT person who moved to Cape Town from Hungary. He was enthused by the idea of 100 in 1 Day — so much that he became the webmaster and a member of the core team. “That was one of many things like that that happened to us,” Nicolás says. Intervention #20 took cars off the road making space for people on the streets to interact and play. Inspired by Open Streets Cape Town. Source: 100 in 1 Day Cape Town Facebook Page. A pivotal shift happened after week seven. Even though the team had met hundreds of people through weekly workshops by then, only 14 people had signed up to lead interventions. Something wasn’t working. As one might imagine, this created a stressful situation for the core team. 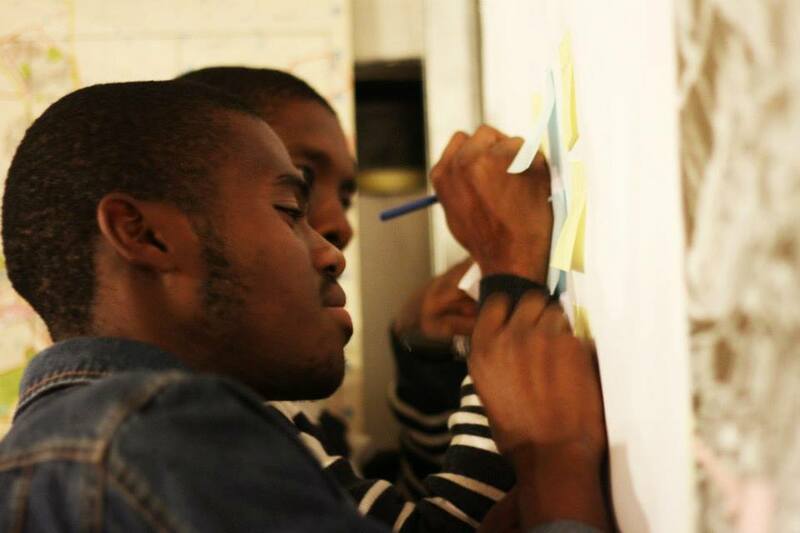 Kaospilot student Yannick Porter, who was in charge of weekly workshops, recalls sitting with two of his Capetonian colleagues as they co-designed the following week’s meet-up. “I kind of freaked out a little bit,” he recalls. “Azraa Rawoot (his colleague) she shakes me and says, ‘You know, I’m an architect. I go to work from the morning until the evening. And then after that I come here to work with 100 in 1 Day and it’s more stressful than my normal job,” he laughs in recollection. 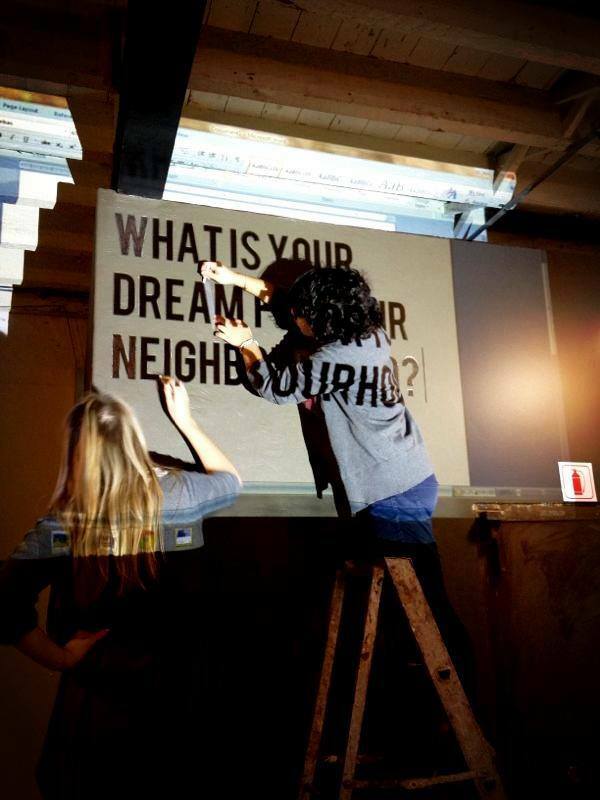 Preparing for a weekly workshop asking Capetonians to share their dreams for the city. Source: 100 in 1 Day Cape Town Facebook Page. Up until that point, workshops had been about building participation and sharing information to inspire people to get on board with the project. They focused on two questions, crafted with an appreciative inquiry lens: “What is the dream you have for your community, or for your neighborhood?” And, “what actions can you take to improve the quality of life in that community?” Appreciative inquiry is a collaborative, strengths-based approach to both personal and organizational development, which Kaospilot students had training and mentorship in. In this moment of frustration, the team realized they were doing a good job of focusing on the first question about dreams, but they weren’t connecting them enough to concrete actions. “Before we had spent something like three-fourths of our workshops on the dream,” Yannick explains. The team considered how the context of South Africa, having endured 350 years of oppression and restrictions on people’s actions, could have played into the slow rate of intervention uptake. “After that, (workshops) shifted into one fifth of the focus on the dream. Before we had the assumption that people didn’t have dreams or that they needed help to explore those dreams. At the end of the period, we came to the conclusion that everyone has a dream. Let’s just put it into action,” Yannick says. Later in the workshop, participants created an intervention to answer the question they posed. “This meant that the first thing they did when they entered the workshop was take action. In this case, it was taking action by writing down a question. This totally changed the mood. (People) were not there to get information; they were there to produce actions that would improve the quality of life,” Yannick says. The next week, intervention sign-ups doubled again. They were up to about 60 with one week to go. At the final meet-up event, every second person that walked through the door signed up for an intervention, adding another 50. On the intervention day, May 25, 2012, 150 urban interventions were made in Cape Town. 100 in 1 Day involves a delicate and dynamic dance between chaos and order, organization and openness, leading and being led. “We had the mission of making it live on when we left, and our strategy to do that was to involve people from day one,” Yannick explains. The Kaospilot students made it clear from the beginning that their stay and their role in the project was temporary. In this way, the handover process began at the initiation of the project. In the early stages, the core team focused on constantly bringing in new people. A simultaneously intentional, yet organic mechanism of shared ownership and responsibility emerged. “When we dropped out, other people took charge. And (when) they left, other people who were further in the organization dropped in. (Meanwhile) you are bringing in new people all the time. You have this as a mechanism running all of the time. Then the project runs without its leaders,” Yannick says. People from Cape Town also maintained the “face” of the project. They led workshops. They presented and disseminated information. They ran public lectures. “People that came to events got quickly used to this. It’s not that guy Yannick who is on stage here and it’s his project. It is our project. It is Cape Town owned,” he says. The organizing team had a guiding picture with three circles that depicted their “currency”: spread the story; do an intervention; and organize. The organizational structure was itself a process, designed iteratively, intentionally and that grew organically with the goal of expanding, as 100 interventions was just a minimum. 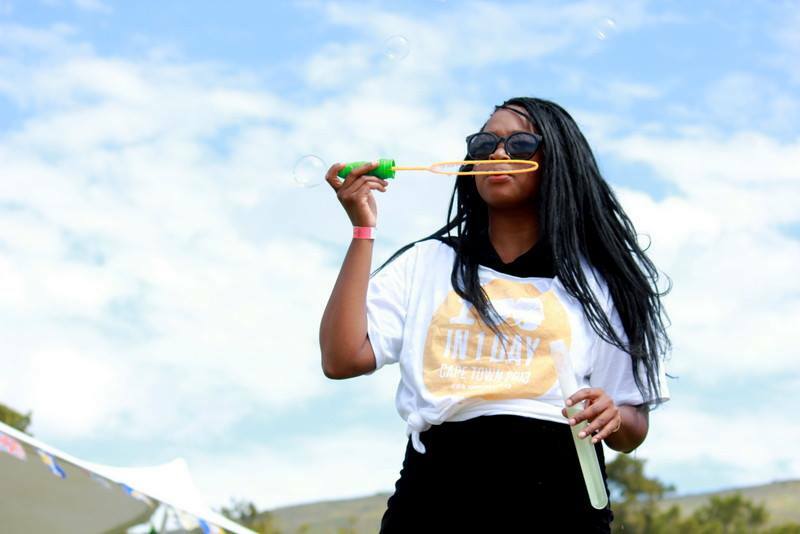 Core team member Didintle Ntsie sporting a 100 in 1 Day Cape Town t-shirt. Source: 100 in 1 Day Cape Town Facebook Page. 1. Connections, responsibility and risk. People who signed up for interventions in the early stages inevitably became some of the project’s strongest ambassadors, as they had something at stake for achieving the collective goal. The organizing team also encountered many people who liked the project’s concept, but who were busy with school, work or life. They learned that allowing people to bite off a chunk they could chew was an effective way to get people involved and invested. If people took responsibility for something they enjoyed being in charge of, this increased the changes that they would want to responsible for something more. Inspired by a concept discussed by Malcolm Gladwell, the team also realized that the stronger the connections were within the group, the greater the risks people would be willing to take. “In this case, the risk was for people to take action upon a dream they had. So in the beginning, we would facilitate a workshop for between 10 and 50 people. In the end, 20 people facilitated a group of four to five people each to strengthen the connection.” On the last meet-up, there were 20 facilitators for 100 participants. The 100 in 1 Day Cape Town organization consisted of five departments: communication and documentation; the action factory (in charge of workshops and interventions); money makers (they had to pay for t-shirts and intervention leader packages somehow); community connectors, who brought in people from different communities and backgrounds; and logistics, which formalized the application process for interventions and provided hot spots throughout the city for intervention leaders on the actual day. The check-ins with intervention leaders, conducted by people in the logistics group, proved very valuable in the last two weeks. They asked questions like: Do you still want to do the intervention? Are there any changes? Do you need anything to get it done? And how can we help? These check-ins helped to remind people that they were part of something bigger and in several cases, helped to make or break people’s participation. Intervention leader meet-up, spring 2012. Source: 100 in 1 Day Cape Town Facebook Page. Beyond the tactics, methodologies and reasons why 100 in 1 Day continues to spread, there is a fundamental component at the heart of each successful project — a common theme that emerges. 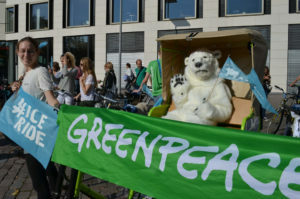 “I think in Denmark, they didn’t find a painful enough need for people to participate enough. There was an event in Copenhagen with 50 or 80 interventions, but it wasn’t that high. The drive for 100 in 1 Day in Bogotá was different from Cape Town and Montreal,” Yannick says. “The one in Chile had a very different perspective,” Nicolás says. He participated in 100 in 1 Day Santiago last month. “What’s alive in the city of Santiago was how to make it more green, easier for people on bicycles, more concrete things. Of course this was part of it (in Cape Town) too, but in Cape Town it was more about how we can connect with each other. It was not an explicit decision of saying this is the theme. But it happened naturally,” he says. The project started in Cape Town with a manifesto declaring that it was not coming from any political, commercial or religious intentions. It was open. “One of the things I think I would have liked to do differently is to put out what our political agenda was. Now when I look in retrospect, I see it being two things: One is participatory, tactical urbanism — which is citizens affecting the way urban planning is being made. The other one was integration. Since we weren’t clear that that’s what we were doing, it was also hard to pinpoint how to direct ourselves towards them,” Yannick says. Nicolás also raises the value of going in with greater intentionality, but he simultaneously underscores the importance that the process provide a framework for whatever the city is ready for to arise organically. The greatest challenge, he says, was to inspire people rather than give them instructions. “To create bridges between all the different realities in the city — that was the biggest challenge. And of course we’re not from (Cape Town) so we didn’t really feel that we could say, ‘this was what Cape Town needs.’ We tried to leave that to Capetonians, not to us. “At the end we took that as an opportunity, as a possibility, as well — to be irreverent; to be curious; to be like a little kid almost, asking the awkward questions,” he says. Another remaining question is how to capture all the collective knowledge emerging from group to group as the project spreads from city to city. In some ways, Bogotá has taken the lead in being that platform, but the amount of information coming out of each iteration of 100 in 1 Day is also very easy to lose track of. Nicolas questions whether capturing it on one platform is even necessary. Last month, Cape Town held a second 100 in 1 Day project — without the involvement of any Kaospilot students — and successfully achieved over 100 collective interventions. On Nov. 1, the group announced that it is an officially recognized project in the World Design Capital Cape Town 2014 program. World Design Capital selects cities on a biannual basis for an opportunity to showcase outcomes of its design thinking over a yearlong period. In 2014, Cape Town will join past selections including Torino, Seoul and Helsinki. 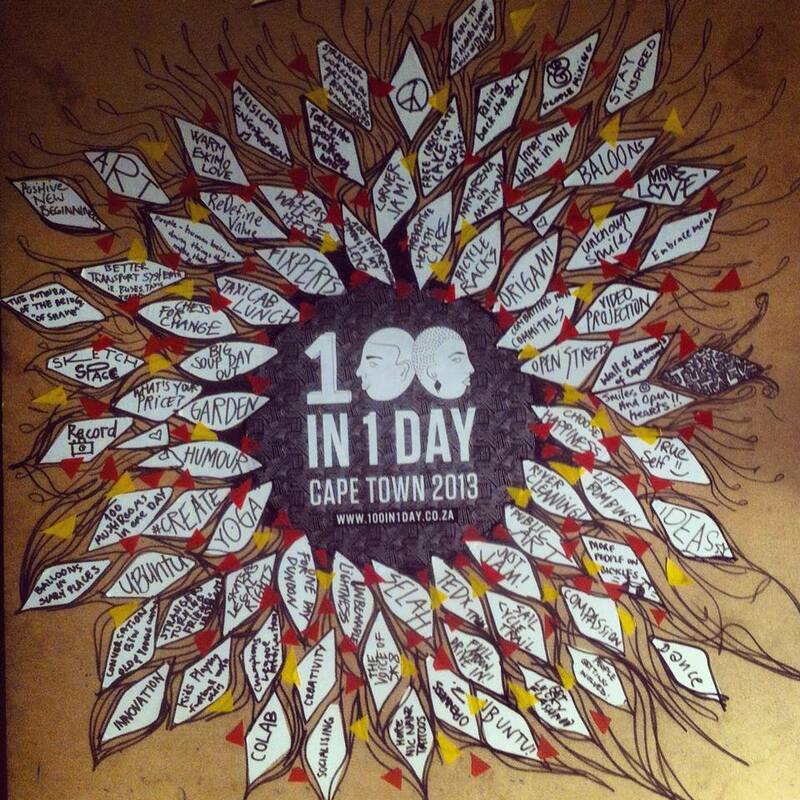 “(The second 100 in 1 Day Cape Town) was very powerful for me on both levels: One, on an organizational movement level. And two is that they’re inviting people who have done interventions to do it again. So it becomes a more regular kind of thing,” Yannick says. That’s where he sees the potential in the project becoming a tool for real social change. “The dream is that projects like these help citizens of the world become closer to each other and that the way we build cities is not a structure of divide, but a structure for inclusion,” he says. If you’re interested in sparking 100 in 1 Day in your city, a former or current organizer in another city would likely be very happy to share ideas, thoughts, tools and experiences to help set you on course. 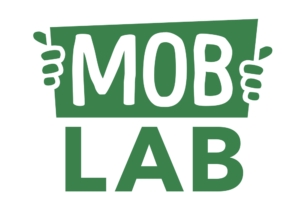 Do you have an innovation in mobilisation and people-powered campaigns? Share it with MobLab by contacting moblab@greenpeace.org.